European equities endured a choppy but ultimately flat session yesterday and are set to be dragged lower this morning by overnight weakness in the States and Asia. What started out as a trickle of profit taking has CFD traders nervous that it could swell up into a gush of selling and lead to a more pronounced decline. The acceleration in negative sentiment has been put down to the uncertainty in Iraq and weaker US economic data, however, for those slightly more esoteric members of the trading community, there is a more otherworldly explanation. For those superstitious traders, we have a host of negative things weighing on the markets today in the form of Friday the 13th, a full moon and a possible coronal mass ejection, otherwise known as a solar flare. Supposedly, Friday the 13th has been part of market superstition since 1907 when a book of the same name was published about a stock broker who tried to crash the market. Fortunately for equities, the historic data doesn't support the idea; there is no increased probability of declines compared to any other day. However, studies by RBS and the Harvard Business Review have shown that stocks do tend to underperform around full moons and, unbelievably, the Federal Reserve Bank of Atlanta produced a study showing that solar flares can also have a negative impact. So, if markets get slammed today and the usual talking heads are at a loss for what happened, now you'll know the truth. A weaker than expected rise in US retail sales, with 0.3% versus 0.6% forecast, coupled with a larger than estimated climb in the weekly jobless benefits, kept US equities under pressure yesterday. The Dow Jones lost 107 points to 16,752, with the short-term trend now turning bearish. The sell off seen in the last two days may have reminded investors that, even though the data remains mostly positive, a few bumps on the road cannot be discarded. We are set to see a mixed start from indices today as traders take stock of yesterday's declines. Many traders used the World Bank's cut to its global growth forecast as an excuse for a bit of profit taking, which resulted in a fairly orderly exit out of equities. In addition, some surprise results in the US elections fuelled concerns of further gridlock in Washington. As a result, the Dow Jones lost 87 points to end at 16,864. Volume did pick up a bit on the way down, and there was no apparent interest from bargain hunters, so all the chatter has now turned to how much further we have to go. Some slight consolidation is seeing European indices open flat this morning. Whilst the FTSE 100 and CAC 40 are both technically opening lower, much of the move is due to some constituents going ex-dividend. The bulls and bears have struck up an uneasy truce at the moment, squaring off whilst they waiting for a catalyst to jolt the markets either way. Interestingly, both sides are using the recent gains as a justification for holding their view, with the bulls citing the momentum effect for staying long, whilst the bears keep saying that a top is in and a correction is around the corner. 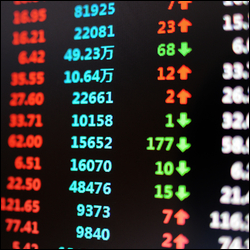 The Dow reversed course towards the close of yesterday's session, paring earlier losses to gain 23 points for the day and finishing at a new high of 16,959. Despite some concerns about equity valuations, CFD trading investors have been generally pleased by the recovery in the US jobs market and, for now at least, refuse to let go of the upside potential. European equities are set to open flat as the bulls take a breather. Although the bulls are unlikely to muster a rapid start out of the blocks this morning, confidence remains pretty high and there are no notable negative cues on the horizon that could derail the rally. However, with many traders holding onto large paper gains, there's always the possibility that someone's decision to book profits could trigger a wider correction. Of course, the way this market has been performing of late, you could also expect bargain hunters to make a pretty rapid appearance if we do see a decline. Despite concerns about toppy valuations in the US, there are signs that M&A activity is still strong, which helped extend the recent rally in equities. As such, the Dow Jones reached a new intraday all-time high of 16,968, before closing rather flat for the session at 16,940. It remains to be seen whether the growing anticipation of a pullback will come to fruition in the short-term. By and large, the 217,000 advance in US hiring was widely anticipated, marking the fourth consecutive month with more than 200,000 jobs created. The jobless rate held at 6.3% and this steady improvement seemed to please investors, who pushed the Dow Jones 108 points higher to a new all-time high of 16,941. European equities are set to start the week with a pop as the bullish close in the US on Friday and a buoyant Asian session overnight indicate that the rally still has some legs to it. It's a reasonably quiet week on the economic calendar, meaning that there's little for traders to get apprehensive about and so we could see the bulls stampede. Having said that, even though the indices are busting out to new highs, it's remarkable how negative traders are feeling about this rally, as evidenced by the amount of spread betting account holders that are getting short. Until the bears capitulate and we start seeing stories like 'Dow to hit 36,000' being splashed across the media again, the top could well be some way off.